The pumpkin I’m writing about is not the American pumpkin that you make your pumpkin pie/soup. It is actually called kabocha squash, but Chinese typically call it pumpkin or ‘nan gua’ in Mandarin. Feel free to use to use other types of pumpkin/squash if you like as long as they don’t have a high liquid content (or they will turn mushy after cooking). All of our family members like kabocha squash, except Richard. So to lure him to eat this healthy squash I have to add some spices and be sure the squash is just cooked and not mushy. 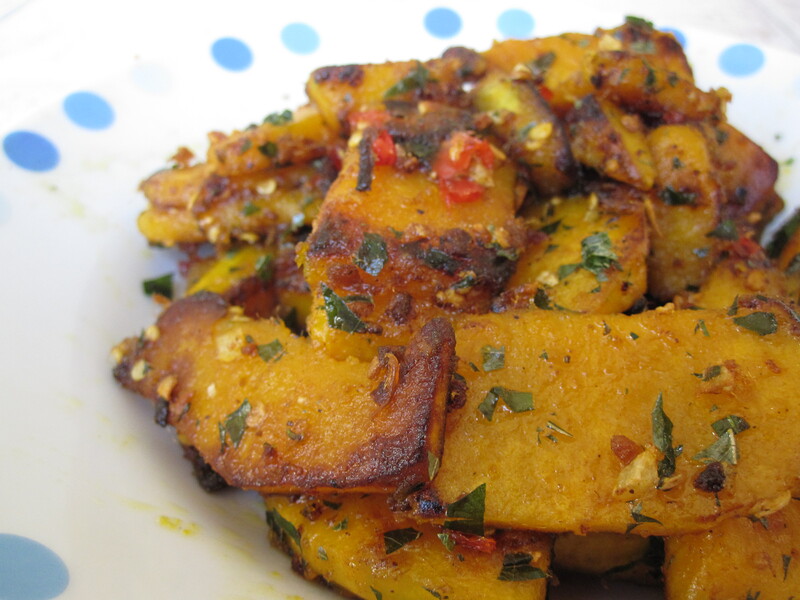 Indeed, the squash tastes very delicious– sweet, spicy and with the flavor of pork floss and aromatic curry leaves. Alexander and Ethan find it too spicy, but Richard just couldn’t have enough of it! Remove skin, seeds and core of kabocha squash. Slice into wedges of 2 inch long and 1/4 inch thick. Finely garlic, hot peppers and curry leaves (remove the stem) separately. Heat a pan with 2 tbsp oil, pan fry squash on high heat uncover until the surface is slightly burned and brown, then flip to fry the other side. Continue frying until the squash reach firm softness. Turn down the heat a little if it brown too quickly. Dish out. Remain the heat. Add 1 tbsp oil to the pan, saute garlic, peppers and curry leaves until aromatic. Return squash to the pan, add sugar and salt then stir quickly. Sprinkle pork floss, toss quickly then dish out. Serve immediately. Crab season is here again. 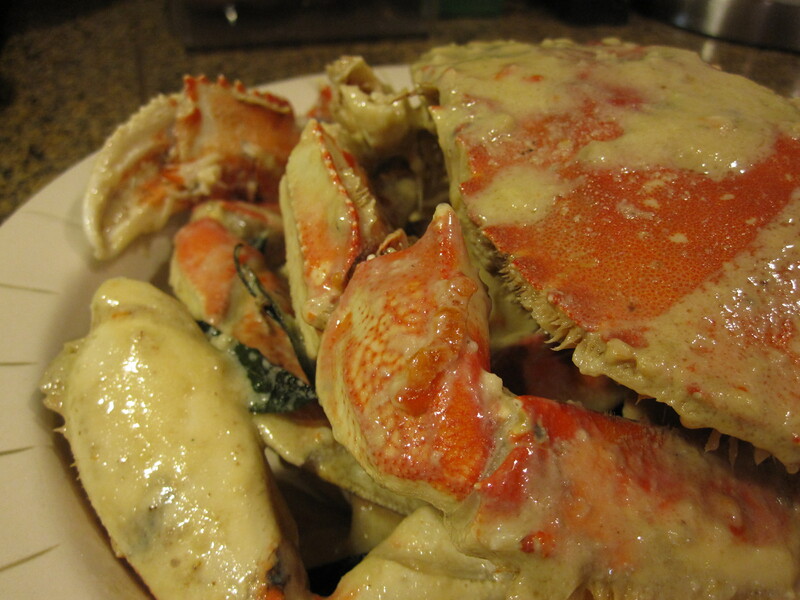 If you are tired of same old steam/boil crab, or the deep fry, saute version, try this buttery crab– it is finger licking good especially the sauce! This recipe requires very few ingredients, one of the must have is curry leaves. If you can get curry leaves I strongly recommend you to give this recipe a try. Clean the crab and cut into pieces. Use paper towels to pat dry the crab. If serving with buns, deep-frying the Chinese buns or mantou to golden brown and set aside. Lay them over paper towels to soak up excess oil. Mix the corn starch with water and set aside. Heat up a wok to medium heat. Melt the butter in the wok before adding the curry leaves, garlic and bird’s eyes chilies. As soon as you smell the aroma from the curry leaves and bird’s eye chilies, add in the crab and stir continuously until the crab starts to turn color. Add the evaporated milk and cover the wok and turn the heat to low. Simmer for about 5 minutes, add salt and sugar to taste, then add in corn starch to thicken the creamy butter sauce. Dish out and serve immediately with buns or steam rice. Note: I tried the recipe using jumbo prawns/tiger prawns instead of crabs, the result is good too but lack of the fresh seafood sweetness as with crabs. Laksa is a spicy noodle soup with coconut milk used in the soup base. It is one of street vendor food commonly found in Malaysia whether for breakfast, lunch or dinner. There are 2 types of laksa in Malaysia: Assam laksa uses tamarind juice. It is more common in Northern Malaysia. The one I’m making is laksa lemak, which uses coconut milk in the soup base and is more common in Southern Malaysia. I forgot to take pictures again this time! 😦 I will try to remember to take some photos next time when I cook laksa. With all that extra laksa paste in my freezer, next laksa meal should be a breeze. Heat up the pot with some oil and stir fry laksa paste with curry leaves until fragrant and curry leaves soak up the oil and turn dark green. Add in chicken broth, coconut milk and bring to a boil. Add salt to taste. (I like my laksa more spicy and slightly thicker broth, so I added in 2 tbsp of sambal chili, and half pack of coconut powder– use the laksa soup in the pot to dissolve the powder). The laksa soup base is ready for use. Fill another pot with water and bring to a boil. Cook noodles, bean sprouts, shrimps and fish balls separately. To serve, put some noodles in a bowl and arrange all ingredients on the top, pour some laksa soup over it and serve hot. Blend all ingredients in a blender with water until fine ( I use blender instead of food processor for more fine texture). Add more water if necessary to make blending easy. Heat up a wok and add 1/2 cup of oil, stir fry the mixture until water evaporate on medium high heat. Then continue to cook on medium heat until it gets thick like a paste consistency. Stir constantly to prevent burn. By now the aroma should come out and the paste is darker in color. Add salt to taste. . Dish out to cool.